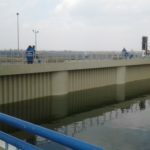 VODOHOSPODÁRSKA VÝSTAVBA, STATE ENTERPRISE (VV, š. p), started with the necessary works for the implementation of the project Upgrade of the Gabčíkovo locks, which is co-financed by the European Union funds. The construction works of the flat dam slab on the upper flap gates of the left chamber has begun. This activity officiate to the control of the condition of the chambers as an entity, as well as to control and repair those parts of machinery that are commonly used during underwater navigation. This include, for example, inflows and outflows, lower and upper gates, hatches on the locks bed, traveling platform of the top of the pier nose, or hatches of internal diversion structures. With the help of a tug and cranes, the top of the flat dam slab of the left chamber lock was carried out, also with help of the divers. Temporary flat dam slab of up to 34 meters in width, 12.5 meters in height and 3.3 meters in thickness has a weight of approximately 220 tones. A condition for successful cofferdam was the water level in the feed channel of about 130.80 – 130.90 m. m. and favorable weather. Construction works requires still air or only a weak wind and a temperature above 0 degrees Celsius. 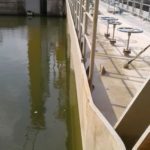 In the summer of this year, cofferdam of the lower flap gate of the left lock chamber will be carried out, and the lock chamber will then be enervated. A so-called large dry dock will be created. „ Regarding the beginning of the implementation of the construction works of the Upgrade of the Gabčíkovo locks, we expect it to be launched this year, but everything will depend on the results of the international public procurement, which is currently being evaluated by the expert commission,“ said General Director Daniel Kvocera and added, that Vodohospodárska Výstavba, pending the inspection of the Public Procurement Authority at the Ministry of Transport and Construction of the Slovak Republic, also a launch of public procurement for construction supervision and an expert control system, which is part of the project Upgrade of Gabčíkovo locks. 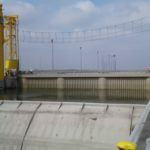 Upgrade of Gabčíkovo locks is co-financed by European Union funds. Total costs of the project are nearly 145 million EUR, while the grant of Connecting Europe Facility covers the 85% of the total costs.